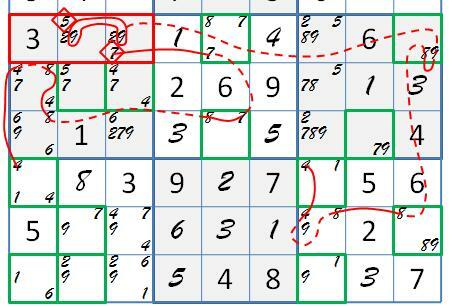 This post checkpoints the bv scan and a verification of a decisive Sue de Coq in GM 5 of the Sudoku, vol.3 Grand Master collection. It also introduces GM 95, an extremely unbalanced puzzle that is due for an intense pattern attack in the following post. 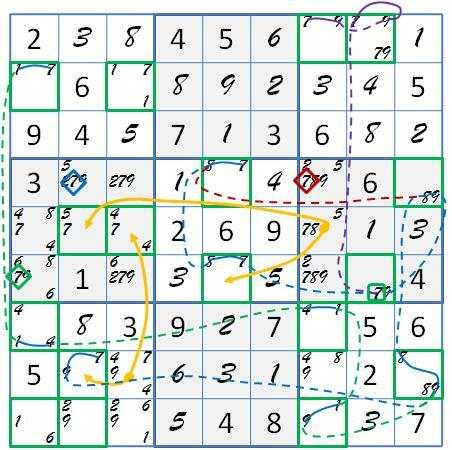 Before we get started on GM 5, an announcement: The basic solving posts of October 2011 have been revised, improving the introduction of sysudoku slink marking, box marking, line marking, and the suset subset finder to Sudoku solvers. I hope you will read through these posts . I’m confident they will increase your enjoyment of my blog. On to business, here are the unproductive wings and the productive XY-chain ANL I trust you found. If not, you might have missed XY-chains. 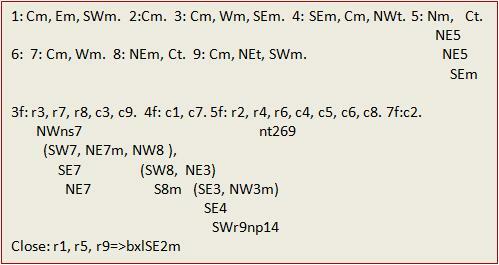 Now the removal of the 7 –candidate in from the chute Wr4 leaves SdC Wr4 = 3(5+7)(2+9) with removals, provided that both 5 and 7 are not missing. The trial trace discovers the contradiction of two 4-clues in r7. This is easily represented graphically on the grid by running a forcing chain from the grouped naked pair 9’s and an AIC from the missing 7. Have some fun by challenging a friend to find the shortest verification path without telling them about the trial trace. Oh wait, you’ll need to explain the full Sue de Coq theory to them first. The verified Sue de Coq removes three 7-candidates , triggering the collapse of GM 5. Returning now to GM 95, the freak in the litter, here is a checkpoint on basic solving, followed by the grid with the last boxline removal. Next, I continue with the bv scan, and have some success with the XY-chain tracks. Look at the X-panel, and think about what to do about the cloud of 6-candidates. 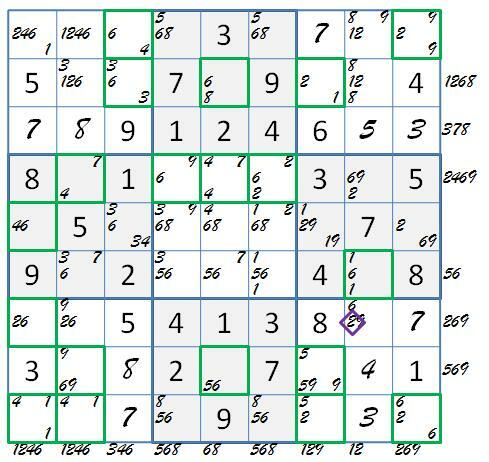 That leads me in a very interesting direction that applies to cloud prone puzzles. This entry was posted in Advanced Solving, Extreme Solving, Pitkow, Puzzle Reviews and tagged almost nice loops, sue de coq verification, Xaq Pitgow. Bookmark the permalink.